Gear Archives - RunStuRun :. Spent the day today waiting for a delivery which finally arrived about 3:00. Then I got to move a bunch of building materials around and stash 2400 pounds of stove pellets in our garage. Good, good times. Now we’re definitely set for winter, however and I can also finish up work on the shed. SO psyched. So today, since I have no running to report, I’ll toss another review your way. 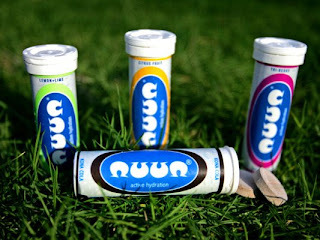 Today’s product review: The many awesome flavors of nuun. I discovered nuun sometime last spring and thought it sounded like a great idea. It removes all the crap packed into common sports drinks: the waste, the high fructose corn syrup – the unbearable taste – and slams it into a compact treat that is not only yummy, but is super convenient. nuun comes in a wide variety of flavors to appeal to virtual any taste. My current favorites: Cirtus Fruit, Cucumber Mint, and Banananuun. nuun doesn’t rely on artificial sweeteners (actually, all nuun is sugar-free) so it is a perfect compliment to your hydration/nutrition regimen. nuun is portable and super easy to use. You just drop a tablet into 16oz of water and watch it go to work. It turns any available (potable) water source into an instant sports drink. Another upside to nuun is that its mix of ingredients keeps one from having to rely heavily on salt tabs during long runs. Sweet! One less thing to have to keep track of when my brain is run-addled anyway. I love being able to re-use bottles without adding to the landfills and being able to create great tasting sports drinks on the go. Each tube contains enough tablets to make 12 bottles of electrolyte drink and costs a LOT less than the equivalent volume of sports drink. Full disclosure time: I was so thrilled with nuun after first trying it this spring that I contacted them to see if they had room on their roster to sponsor an athlete such as myself. For the ’09 season, I was a proud member of their pro program. In 2010, I am happy to announce that I will continue to fly the nuun flag!